Editor’s Note: Australians are making innovative use of satellite television to teach Technical And Further Education (TAFE) courses in rural areas of Northern New South Wales. This paper describes successful delivery to remote homesteads and communities and explains how satellite technology is addressing the “digital divide” in remote areas. The Interactive Distance Learning Satellite Project (IDL) involves partnerships between Optus, NSW Department of Education and Training, Northern Territory Department of Education, local communities and schools to support flexible delivery programs. With satellite technology, TAFE NSW Western and North Coast Institute are able to provide interactive lessons and learning to students in remote NSW homesteads and to provide vocational education courses to rural and remote Aboriginal and non-Aboriginal communities. The IDL satellite project in NSW has been implemented by Outreach and Aboriginal Programs via a partnership between Western and North Coast Institutes and utilising the DET Distance Education, School of the Air studios. Studios are located in Dubbo, Port Macquarie and Broken Hill. 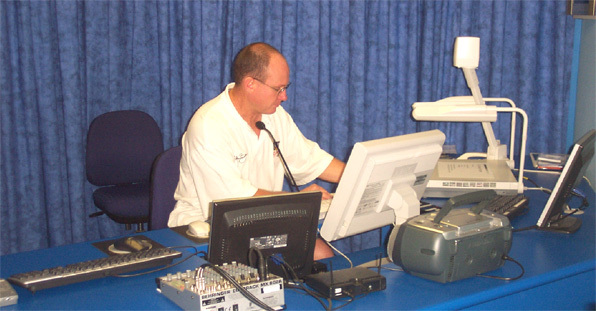 Rural and remote homesteads on School-of-the-Air programs from Broken Hill and Distance Education programs from Dubbo and other school sites are linked to the network, and can receive training from these studios. The Institutes also have a mobile satellite trailer and laptops that can logon to studio lessons. Remote Aboriginal communities utilise the satellite trailer to access TAFE training. Students receive interactive lessons on their PC’s using specialised software that enables students to see and hear the teacher, hear other students and receive shared applications that aren’t directly loaded on their own PC. Teachers are able to hear students and can control what students see and hear and what programs they can access. There is an internal mail feature with ability to share web links, PowerPoint presentations, and documents, and conduct interactive quizzes. The interactivity of the satellite technology has been hailed by many participants as providing a breakthrough in distance education. Outreach has identified the learning needs of these target groups and has used the satellite technology to provide training to remote homesteads and Aboriginal communities over the past two years. The range of TAFE courses and subjects that have been successfully adapted for satellite delivery has exceeded what was previously thought possible. Even very practical subjects are delivered. Sessions on basic computing, modules that support home tutor training and programs on building maintenance, tractor maintenance, electronics and Aboriginal Cultural Practices have been delivered successfully. Students have warmly received this training. This is an exciting project for both students and teachers, and has provided new learning opportunities for students previously unable to attend TAFE. During the past two years over 500 of the most isolated people in NSW have become TAFE students via satellite, many accessing TAFE for the first time. The IDL satellite project has been so successful that the IDL team has recently won further Federal funding under the Commonwealth Communications Infrastructure Fund, with contributions from Optus, to build a dedicated TAFE studio which will allow for greatly expanded TAFE delivery to existing remote sites and another 400 new sites. 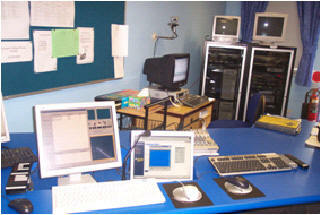 In 2002, a consortium comprising Optus, the New South Wales Department of Education and Training and the Northern Territory Department of Employment, Education and Training commenced a national project providing interactive distance education to students located in the Clarence, Murray-Darling and Dubbo areas of New South Wales and the whole of the Northern Territory. The TAFE NSW partnership involved Optus, the TAFE NSW-North Coast and Western Institutes, the NSW DET Aboriginal Programs Unit and the TAFE Equity and Outreach Unit, with generous support from DET Distance Education IT staff. The TAFE component of the project focused on remote or rural Aboriginal communities and delivery to people on homesteads where there were Distance Education students. The use of mobile and fixed satellite dishes in this pilot project allowed, for the first time, isolated Aboriginal communities and other rural remote learners to access the Internet to participate in TAFE courses. The IDL satellite project generated much excitement and innovation amongst participating students and teachers. Many students described as “life changing” the experience of studying TAFE courses in an interactive and supported environment. The project also contributed greatly to organisational learning as it pushed the boundaries of e-learning and developed new pedagogies. The piloting of cutting edge technology to deliver to remote Aboriginal communities proved the suitability of the technology to address the digital divide for Aboriginal people. In excess of 500 adults were enrolled in TAFE courses delivered via satellite over the two years of the project. These students lived in some of the most remote parts of NSW, in isolated homesteads with no previous access to interactive training and education. Students’ learning needs and interests were assessed prior to enrolment with modules selected and customised to meet their needs. Due to the innovative nature of the project and the technology it utilised, a great many resource and learning materials were developed or customised to support the students’ learning. These resources and the pedagogy of learning via interactive satellite classes have contributed greatly to TAFE NSW’s e-learning approach. Subjects studied via satellite ranged from basic and advanced computing and other IT skills to Aboriginal studies to art to the more traditional TAFE subjects such as farm engines, building maintenance and electrical safety. All modules delivered were accredited TAFE modules and completion rates were very high. This project resulted in people living in the most remote and isolated parts of NSW being able to access, for the first time in many cases, interactive distance education. The uptake and completion of TAFE courses by isolated individuals and communities exceeded expectations with the target enrolment figures surpassed by both the participating TAFE NSW Institutes. The target enrolment figure for the two years of the project was agreed at 460 enrolments. This target has been exceeded by 57 extra enrolments, funded from TAFE NSW core budgets. The range of subjects successfully delivered by satellite classes again exceeded what was thought to be possible with even very practical TAFE subjects like Farm Building Maintenance being able to be adapted to satellite delivery. a) Access. For isolated and remote families, communities and schools who previously did not have access to TAFE provision, a range of cutting edge teaching and learning communication technologies were utilised to deliver TAFE courses. Satellite delivery has also enabled access to learning opportunities beyond the learners region and it changed traditional approaches to delivery in small communities. b) Engagement. The high level of attendance and high completion rates clearly demonstrate that this mode of delivery has the capacity to enthusiastically and successfully engage isolated learners. Aboriginal communities have embraced opportunities for engagement in mainstream technologies and they can now access more technologies within their own organisations. This engagement also has the potential to provide pathways for accredited learning. One respondent believed that the NSW TAFE IDL project had created a ‘cultural shift’ in Aboriginal communities keenly considering future possibilities. Outreach Coordinators, Aboriginal Development and Equity Managers. educational and ICT staff who worked together in problem solving to enable maximum efficiency of the technology. young Aboriginal people who were experienced IT users and their elders. family members who participated in this project eg parents who supported their children’s learning and children whose lack of inhibitions using IT supported their parent’s use of technology. non-teaching TAFE staff visiting isolated locations and ‘seeing’ the educational/learning process. Aboriginal Programs unit and TAFE staff in developing both a learners and facilitators guide in using the technology, which includes case studies specific and relevant to indigenous learners. In addition, it provided learners with opportunities for group interactions and discussions, thereby minimising isolation. d) Synchronism and real time learning. The interactivity of the learning process in this project was repeatedly raised by respondents and in student evaluations as providing a breakthrough in distance education. Distance modes previously used in TAFE have often restricted opportunities for interaction across learners and between teacher and students. Strong views were expressed in this Study indicating that projects that include strategies that allow students to share, collaborate and/or converse must be supported. e) Capacity building within TAFE and communities. Capacity building is about increasing the abilities and resources of individuals, organisations and communities to manage change in their lives and communities. Communities of practice are established during this process as people and groups become involved in creating and managing change. This project developed a community of practice amongst TAFE staff and students that broadened their knowledge, use of, and interaction with, other technologies. 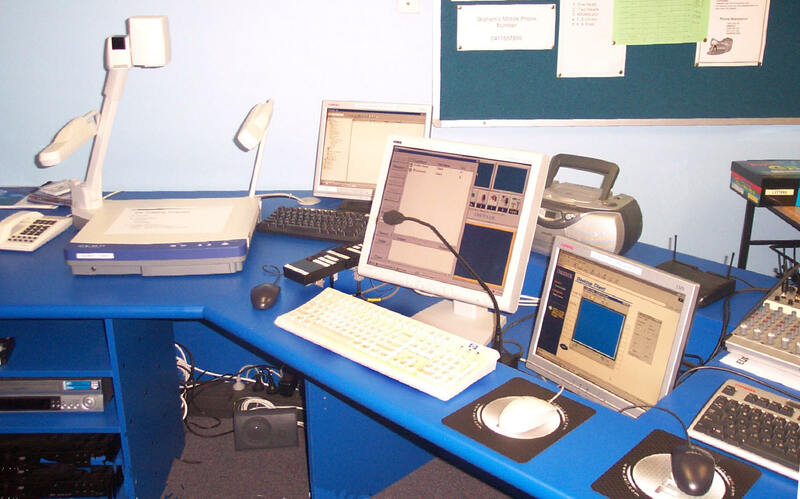 Organisational learning allowed NSW DET to identify the major educational, administrative and technological issues involved in satellite delivery. It enabled administrative, teaching and IT staff to use initiative and creativity in providing services and to consider and clarify their roles and responsibilities in pursuing this mode of delivery. This project not only required interactive technology but also necessitated interactive processes, communication and structures for that learning to be addressed and evaluated and to inform practice. Communities and individuals have increased their capacity to utilise technologies and engage with education and government sectors and the broader Australian community. Most significantly this project provided cutting edge technologies and effective learning approaches to adult learners who may have not participated in learning since they left school. Satellite delivery provides a means of monitoring and addressing the ‘digital divide’, which is an international concern in communication technology. Following the success of this project, the consortium has been successful in winning further Federal funding for 2005 to 2009 to expand the capacity for TAFE satellite delivered courses in remote locations. This funding will allow the building of a dedicated TAFE studio which will in turn allow for greatly expanded delivery, especially during business hours. The increased capacity that the TAFE studio will provide will ensure satellite delivery becomes further entrenched in TAFE’s e-learning responses to the needs of remote learners. The Federal funds will be matched by the consortium, allowing for services to be expanded to a further 15 Aboriginal communities and another 340 individuals. To meet the extra demand, curriculum developments are underway and planning commenced to train more TAFE teachers, across several Institutes and the Centre for Learning Innovation, in the pedagogy and technical skill to deliver via satellite. Jane Kirton and Associates (2005).T AFE NSW Interactive Distance Learning via Satellite Project – A discussion paper. Dubbo Studio Instructor Station – 2 views. 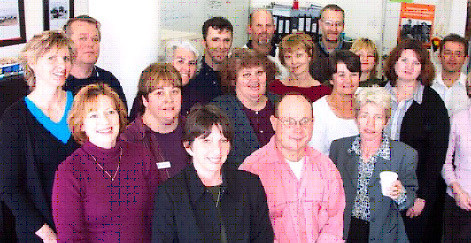 The Teaching Team – Dubbo, Nw South Wales.